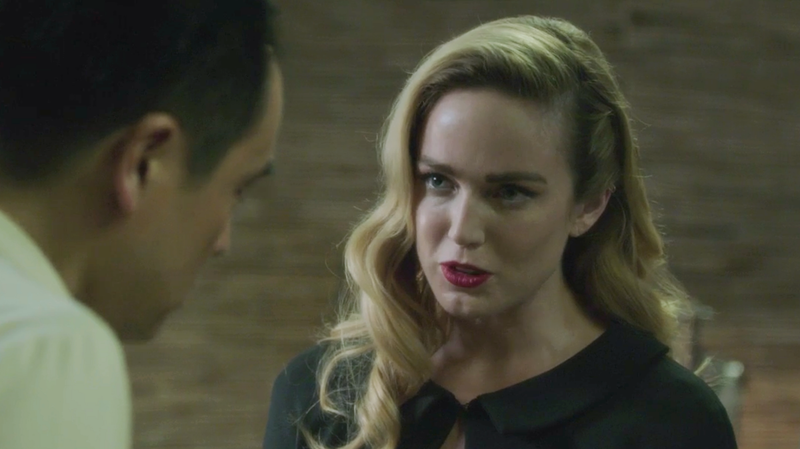 Sara Lance (Caity Lotz) comforts the grieving director. Turns out, you can have too much of a good thing. The Thanksgiving Kaiju episode of Legends of Tomorrow was a bit chaotic, giving us four distinct storylines and subplots piling on top of subplots, to the point where it was hard to care too much about any one person or situation. But there was one scene that made the whole ride worth it. It seems fitting that the latest episode of Legends of Tomorrow, “Tagumo Attacks!! !”, features three exclamation points in its name. This episode is one busy beaver—I mean giant mutated octopus. Ray and Ava Sharpe are navigating Thanksgiving dinner with Ray’s family, while secretly trying to help Gary get a handle on some escaped magical creatures. Ray has teamed up with Nora Darhk to cure John Constantine, who’s near-death after using his life force to help a kid in last week’s episode. And then you’ve got everybody else dealing with a living Kaiju while working through their own personal monsters. The main plot centers around Ishirō Honda (Eijiro Ozaki), the director who helped give us Kaiju cinema in the form of Gojira (Godzilla) and other iconic Japanese movie monsters. And it turns out, he’s more connected to this new monster than we thought. Tagumo, a giant octopus threatening the city of Tokyo, isn’t some fugitive that escaped from a magical hell dungeon—it’s the creation of Ishirō himself, who came across a magical book that brings his dreams to life. This prompts Sara, an empathetic soul, to give comfort to the still-grieving Ishirō. It’s not his fault: He used his creative gifts as a way to contextualize his pain, and there’s nothing wrong with that. It was really special to see, even as a giant monster threatened the entire city, that Sara and the others easily forgave a man who was only trying to give his trauma a voice. It was a powerful message supporting creativity as therapy—and given the constant threat school arts programs are facing, it’s a message that’s more important than ever. After all, if we didn’t have the arts, we would have been deprived of Mick’s sci-fi erotica novel, where a blue-skinned, three-boobed warrior named Karima fights a shrink-rayed Tagumo in a miniaturized Tokyo, saves the day, and immediately fucks Mick in the ruins. I don’t want to live in a world where that doesn’t exist. It’s (almost) everything I could have ever wanted. As much as I loved the final battle between Karima and Tagumo, I was disappointed that the moments Ishirō was filming continued to feature the CGI octopus, instead of one created with practical effects. I get that the show’s monster is actually real, not a guy in a suit, but it would’ve been a great nod to tokusatsu filmmaking. Plus it would’ve been classic Legends of Tomorrow to pull that kind of switch-a-roo and never explain it. LOL at Mick giving Ishirō the idea to do Godzilla. Sure, why not. I like how Nora is striving to stay on the right path, and her chemistry with Ray is undeniable (yes, I know the actors are married), but I felt she was underserved in this episode. Let’s hope her surrender to the Time Bureau results in a new journey for Nora. One that keeps her in Ray’s sphere. Well, it’s official: Charlie is the new Nate. There to explain anything magical creature-related that Constantine doesn’t know. That seems fine, but I question her qualifications. We knew Nate was a historian, but Charlie’s expertise is because she was in jail with them? That’s not enough, I’m sorry. We need a better sense of how long she’s been alive, what she was up to before getting imprisoned, and what her relationships have been with other magical beings. Otherwise, it’s just... she knows because she knows. We finally got a Back to the Future joke! Took long enough, butthead.